In the summertime it can seem like fun to spend hours with your Labrador Retriever tossing a ball in the water for him or her to fetch. On especially warm days, spraying your dog with a hose or allowing him or her to play in the sprinkler might also seem like a good way to cool down a hot pup. 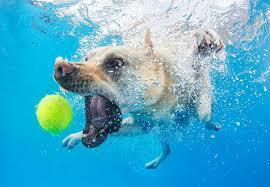 However, these activities can be dangerous for dogs, as they may result in water intoxication. How are Fetching Toys / Hose Spraying Dangerous? When dogs fetch toys in ponds, lakes, or pools, they inevitably swallow water with every retrieve. Some dogs have a tendency to bite at water when they swim, especially when the waves are rough. When dogs “catch” pressurized water from a garden hose, they can also accidentally ingest an excessive amount of water. This problem is more pronounced in small dogs, or dogs that will spend the entire day in water if allowed. When dogs drink too much water they are at risk for developing hyponatremia, which is a condition that occurs when natural sodium levels in the dog’s blood stream are diluted. Hyponatremia occurs when more water is ingested than the dog’s body can naturally process. The excess water dilutes bodily fluids, such as blood, creating a shift in the dog’s ideal sodium and electrolyte levels. Since sodium is important for regulating many processes within the body, such as brain and heart function, hyponatremia is especially dangerous. As sodium concentration decreases, the dog’s cells will fill with water in an attempt to remedy the problem. Therefore, cells will start to swell – including cells within the dog’s brain. When a dog is experiencing hyponatremia, symptoms include incoordination, dilated pupils, light gum color, bloating, lethargy, vomiting, glazed eyes, difficulty breathing, excessive salivation, and coma. If you suspect your dog is suffering from water intoxication after spending all day getting wet, it is important that you take him or her to an emergency veterinarian immediately. At the veterinarian’s office, diuretics, intravenous electrolytes, and supportive care will be provided in order to reduce swelling in the brain. When caught in time, hyponatremia can be reversed. How Can Hyponatremia be Avoided? If your dog is enthusiastic about playing in water, enforce regular breaks to ensure that he or she is not hyper-hydrating. If playing with a sprinkler or hose, keep your dog from drinking excessive amounts of water. Additionally, on warm days it is important that your dog not drink too much water immediately after exercising. When tossing toys into lakes, pools, or ponds for your dog to retrieve, alternate water retrieves with land retrieves so that you can minimize the risk of drinking too much. Pet owners should also be aware that hypernatremia, also called salt poisoning, can occur if a dog drinks too much salt water. Signs for this condition include vomiting, diarrhea, loss of coordination, seizures, lethargy, and brain swelling. 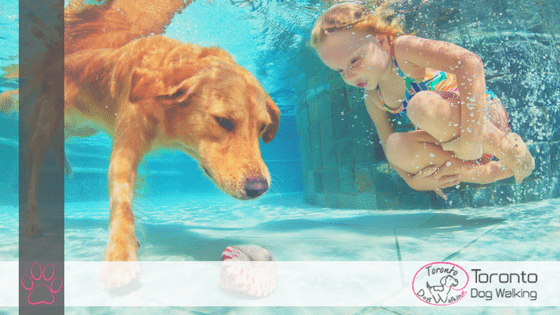 The key for preventing both hypo- and hypernatremia is moderation when it comes to your dog’s water activities.